Monumental Italian frames from Tuscany, early 19th century with original ebony finish and hand-embellished gilding. Original forged iron loop at top. Would make exceptional mirror frames. Measurement is to top of frame. Frames show losses, but their patina is an embellishment to their character. Gilt forged iron hall mirror by Pierluigi Colli for Cristal Art, Italy, circa 1950. Beautiful wear and patina. Matching bench also available see listing LU114028323603. 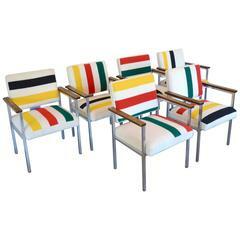 Vintage Mid-Century Modern armed side chairs or office chairs with stainless steel frames, wood arms and custom Pendleton blanket (same style as Hudson Bay) upholstery. One available. A French 19th century enamel on copper pair of plates, circa 1880 Two polychromed enameled plates representing a Renaissance couple of costumed nobles, circa 1880. Late 19th century wood Italian frame. 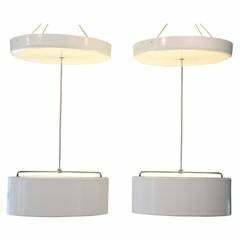 A pair of Wunderkammer hanging convex mirrors round shape mounted in a light gray cherry wooden frames.